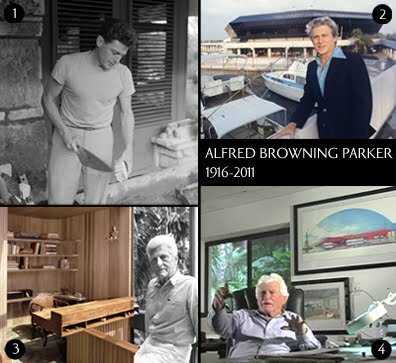 Alfred Browning Parker passed away Friday, March 11th near his home in Gainesville, Florida. He was 94. 1) Parker as owner, designer, & builder (“3-in-1″), 1953 Coconut Grove, FL. “I like nothing better than to build with my own hands”, Parker told the Miami Herald. 2) Parker in front of his 1970 “Miamarina”, Miami’s downtown marina with restaurant, lounge & snack bar. “… renowned as one of Miami’s most “socialite” architects, but still spends a quarter of his time working on actual construction”, wrote the Miami Herald. 3) Relaxing at “Woodsong” (1972 Parker family home, photo of Parker approx. 1985). In 2006 “Woodsong” was choosen as one of Wallpaper magazine’s 10 best houses in the world. 4) Parker discussing his “America’s Bridge”. A 2001 design to replace the Twin Towers at the World Trade Center in NYC. A drawing of the red bridge is on the wall behind Parker.